The gift basket industry has exploded over the past few years and continues to be a consistent money maker for those involved in it. In many ways, it’s the ideal business. You can run it from the home. It’s an extremely inexpensive business to start (you only need supplies and a marketing budget). The product is in demand (who doesn’t like getting an artistic basket with fresh fruit, candies, or wines?). Competition isn’t much of a problem (you can easily set yourself off from the rest by producing specialized types of baskets). It’s a dynamic business that is changing and developing with the times. One of the newest developments is the candy flower basket. This is a new type of gift basket that will definitely set you apart from your competition. It’s very artistic and creative, and pretty, too! The Candy Flower Basket is easy to make, and will turn heads wherever it is given. Here’s what you need for a Candy Flower Basket: You’ll need a basket, of course, preferably around the size of a medium to large flower pot (remember, we’ll have “flowers” here). Next, a large piece of flower arranging or art styrofoam, large enough to fit in the bottom of the basket, filling it well and reaching up to around 3 inches below the lip of the basket. Also, plenty of stiff, green wire used in flower arranging; green flower tape; 2 1/2″ green wood sticks, pointed on one end, blunt on the other; thin wire; a good supply of different wrapped hard candies, preferably with colorful wrappers (yellow, orange, red, pink, and other “flower” colors are best); and, finally, a LOT of bright, colorful cellophane sheets (green and red, especially). Many of these supplies can be found at craft stores or flower arranging supply stores. First, we’ll make our candy flowers. Cut the stiff green wire into 1 foot lengths. Make around 15 for a decent size basket. Now, sort your candies by wrapper color. You’ll need 5 or 6 candies per wire. Take one of the candies and hold one twisted end of the wrapper against the end of the wire. Now, wrap the green floral tape tightly around the wrapper and wire a few times. Don’t tear the tape; once the candy is firmly attached to the wire, continue the tape down the wire and wrap another candy around 1 to 1 1/2 inches below the first, depending on how many candies you’ll put on the wire. Continue this down the wire. When you’ve wrapped 5 or 6 of the same candies on the top half of the wire, trail your tape off another inch or two on the wire. You’ve just made your first candy flower! Set that one aside and start on the next one. Try to have at least 4 different types of candies, so all the flowers won’t be the same color. Next, wrap the styrofoam in green cellophane and put it into the bottom of the basket. Take your colored cellophane sheets and cut around fifty 6″ x 10″ rectangles. Don’t worry about making them perfectly sized. Take one of the rectangles and loosely fold it in half the short way (to make a 6″ x 5″ rectangle) and then in half the long way (to make a 3″ x 5″ rectangle). Don’t crease the folds, and again, don’t worry about being perfect – it’ll look better if it’s not. Insert this rectangle into one of the open spaces closed point down (the point that would be the center of the rectangle, if it was unfolded. Do this with 20 to 25 of the rectangles, until the open spaces are filled, though not tightly. Fluff the open corners of the rectangles out. Now, insert your flowers into the styrofoam. Space them out evenly, and put around four inches of the wire down into the foam, so it’s secure. Here’s a tip – slightly curve the wire and insert it at a slight angle, so the flowers sit realistically. Real flower bouquets don’t stand straight up. When done, fluff the open corners out. You now have a Candy Flower Basket! The best thing about this is the fact that it looks BETTER after the candy is removed! Put a note in with your basket suggesting that people unwrap only the unattached end of the wrapper to remove a candy. The candies look like buds while they’re wrapped; they look like blooming flowers with the candy removed! Try it with one of your flowers and you’ll see! 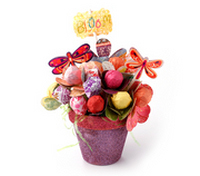 Take into account the cost of your supplies and your time when pricing your Candy Flower Basket. These can be a bit time-consuming, but you can always make a large stock of flowers and fill-in “greenery” ahead of time while watching TV. Or, get some friends involved. Baskets like this can easily be sold for P100 to P1000, depending on the size of the basket, with only a few peso worth of supplies. Their uniqueness will definitely be an important selling point. Make a few baskets of different sizes up, for sales examples. Candy Flower Baskets can be a great addition to your line, if you already produce gift baskets, or they can be a fantastic way to start out in this profitable business. And don’t think it’s just for women; there are many men who are producing great gift baskets out there. Anyone, young or old, can produce these baskets and make massive profits…and have a lot of fun in the process!